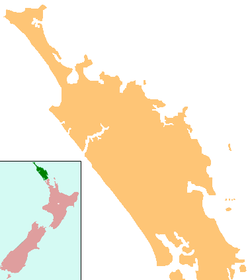 Kawakawa is a small town in the Bay of Islands area of the Northland Region of New Zealand. It had a population of 1,221 in 2013, down from 1,347 at the 2006 census and from 1,401 in 2001. Kawakawa developed as a service town when coal was found there in the 1860s, but coal mining ceased in the early 20th century. The economy is now based on farming. The town is named after the kawakawa shrub. Kawakawa starting developing as a town with the mining of coal, which was discovered there in 1861. A horse-drawn tramway was opened in 1868 to carry coal from the mines to the Taumarere wharf. In 1871 two steam locomotives were acquired and the tramway was upgraded to railway standard. In 1884 a railway line from Kawakawa to Opua was opened, and this replaced the line to Taumarere wharf. By 1899 there were about 1,000 residents in the town, which was built mainly on the hillside. In 1899 a fire destroyed all but a few of the buildings. The town was rebuilt on the flat, alongside the railway tracks. The present railway station was built in 1911. A railway line south to Whangarei was completed in 1911. Coal mining ceased at Kawakawa in the early 20th century. The Bay of Islands County headquarters were in Kawakawa until the county was disestablished in 1989. Kawakawa has three marae affiliated with hapū of Ngāpuhi. Mohinui Marae and its Hohourongo meeting house are affiliated with Ngāti Hine and Ngāti Kahu o Torongare. Kawiti Marae and Te Tawai Riri Maihi Kawiti meeting house, and Miria Marae and Te Rapunga meeting house are also connected to Ngāti Hine. 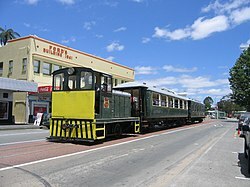 The town is known as "Train Town", because the Bay of Islands Vintage Railway runs down the middle of its main street on the former Opua Branch railway line. Eight km of the 17 km track reopened in 2008. At present trains cannot go over "Long Bridge" because rails have not been relaid since it was re-piled, and the track between this bridge at Taumarere and Opua is being used as part of the Twin Coast Cyclepath. When the rails have been relaid, the cyclepath will be moved next to the track. The town is also famous for its Hundertwasser toilet block, designed by Austrian artist Friedensreich Hundertwasser, who was a resident of the town from 1975 until his death in 2000. The Kawiti glowworm caves at nearby Waiomio are also an attraction. Kawakawa Primary School is a full primary (years 1-8) school with a roll of 210. Bay of Islands College is a secondary (years 9-13) school with a roll of 422. It takes students from around the Bay of Islands and middle Northland, with 85% of its students travelling daily by bus to attend. Both schools have a decile rating of 1, and are coeducational. Karetu School is another primary school in the Kawakawa region. ^ "2013 Census map – QuickStats about a place". archive.stats.govt.nz. Retrieved 2018-11-11. ^ a b c "Northland places – The Waiōmio valley". Te Ara: The Encyclopedia of New Zealand. 4 May 2015. Retrieved 13 January 2019. ^ "Kawakawa, New Zealand history online". nzhistory.govt.nz. Retrieved 11 November 2018. ^ "Our history". Bay of Islands Vintage Railway Trust. Retrieved 13 January 2019. ^ "Kawakawa Travel Guide". Jasons Travel Media. ^ "Bay of Islands College - School Information". Archived from the original on 2007-08-08. Wikimedia Commons has media related to Kawakawa. This page was last edited on 25 February 2019, at 04:28 (UTC).